So, as most of my car friends know, I've been thinking about what wheel upgrade I should go for. The choice of what spec and size I should select has been easy. In order to easily pass shaken, the wheels/tires cannot protude beyond the fenders. For the stock wheels, this is not a problem - in fact, I would say that the wheels are located too much inboard, with lots of fender overhang. 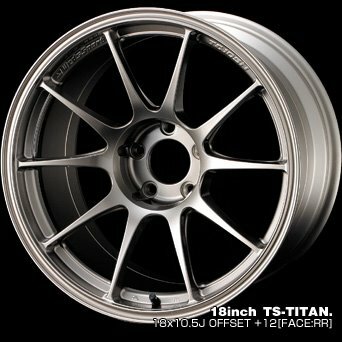 Talking with various Nissan technical people (including Tamura-san as well as Honda-san/Koyama-san at NPT Motorsports) the recommended size has been 18 inch diameter, 9.5 inch width, and offset of 10~15 (I think the stock offset is 38mm!). 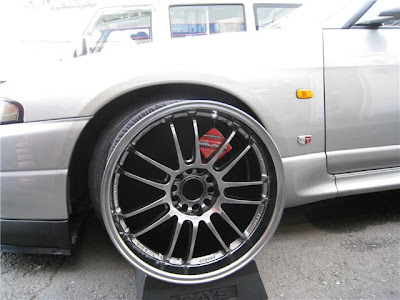 From what Tamura-san told me, the R33 was from the beginning designed for 18inch wheel fitment - however due to cost considerations at the time of release, Nissan stuck with 17inches. I think Koyama-san told me the same thing. So size is a given. Next would be what manufacturing process. Although forging is expensive, I think it's worth it. There are semi-forging processes out there with high strength and light weight - for example the WedsSport TC105N - but in the end, even the Weds people I talked to at TAS2009 had to admit that a forged wheel was going to be stronger at the racetrack. Plus, the "titanium" color unfortunately did not look as good in person as it did in photos. 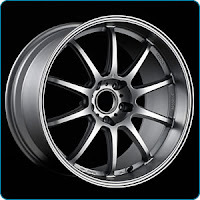 So, forged wheels in 18x9.5 with 10-15 offset is ideal for the RB26 GT-Rs. Not hard to believe, in Japan this is known as the "GT-R size" when shopping for wheels - and this commands a price premium as well. Damn. Well in that case, should get the lightest and strongest forged wheel I can find...which led me, not surprisingly, to Rays Wheels. And of their sport oriented models, 3 choices were readily apparent as the best one for my car. The TE37 (6 wide spokes), CE28N (10 even thin spokes), and the RE30 (14 doubled think spokes). The problem here was not one of price, but in my quest to be different - I didn't want to put on a wheel commonly found on GT-Rs, especially 33s. 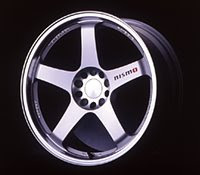 So from the beginning, I wasn't that interested in the TE37 (or the 5 spoke Nismo LM-GT4s, made by Rays - look good on the Nismo cars/replica cars, but I don't have a replica car...). 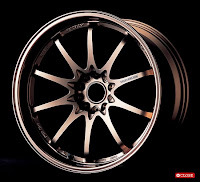 So this meant, either CE28Ns, known as one of the lightest forged wheels out there, or the RE30. I have seen CE28Ns on other R33s, and looks OK I think. 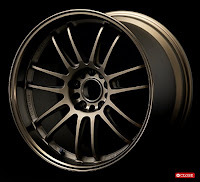 Along the way, I was also looking at the Pro-Drive series of wheels - like the GC010G and GC06H (and the new for 2009 GC05K) but these are even more expensive and furthermore, couldn't figure out their weights (for the GT-R size, about 8.3-8.8kgs, I have found/guessed from various sources). These wheels are gorgeous, especially in their "British Black" color - and in fact these wheels are made by Rays. Also, what was interesting is that the assistant shop manager there - Takeda-san - had told me he felt that the TE37, despite its reputation as the most solid of the 3 Rays wheels (and heaviest) did not feel as rigid in hard driving as the RE30 (I guess that's why the shop's tuning car runs on RE30s...). So - almost as light as the CE28Ns, and more rigid than the TE37s. Appears that my decision has been made, purely on technical grounds! Ok well then what color? 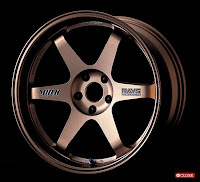 Besides the bronze that Rays offers as above, there is the soon to be disconinuted standard Chrome Silver, and for 2008, there was the limited edition Formula Silver (slightly darker silver) with the rims Diamond Cut (no paint, just polished metal). There are also the special order Rays colors - like gunmetal, black, etc. 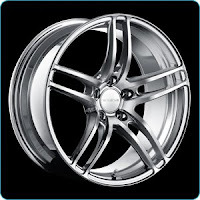 I wanted the Formula Silver, but was not sure about the DCR (diamond cut rim). Looks cool in the photos, but - one, I had seen reports on Minkara that the contrasting colors made the wheel look small, and also I was concerned about brake dust from the PFC brake pads becoming a real hassle to remove (if they got burnt on, say) - if it was possible at all. What do you think? As a bonus - check out these two photos. I lined up 2 wheels (Formula Silver, but NO DCR) in front of my car. Unfortunately, a photoshop would have been better, because the tires are hidden, but at least you can get an idea of how the colors (body color and wheel color) look next to each other. Well -send me a message or email, what wheel? Remember, wheels are the soul of the car ;) but I think your choice is for a road/track use then...Ce28N or Re30 are good, even pro-drive GC010G (similar like Ce28n). I love it Te37 or Nismo Lm but as you say, are very common and imho, LM doesn't feel good to BCNR33. 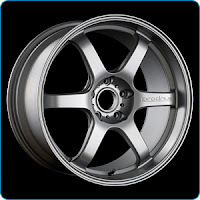 These new wheels would be only for track days and for normal use would fit oem r33 wheels? ?